Friday, May 11, 2018 – CMON Limited announced today that they have teamed with Gaumont, the oldest film company and producer of Narcos to design and publish Narcos: The Board Game, based on the Golden Globe and Emmy ® award-nominated television series. 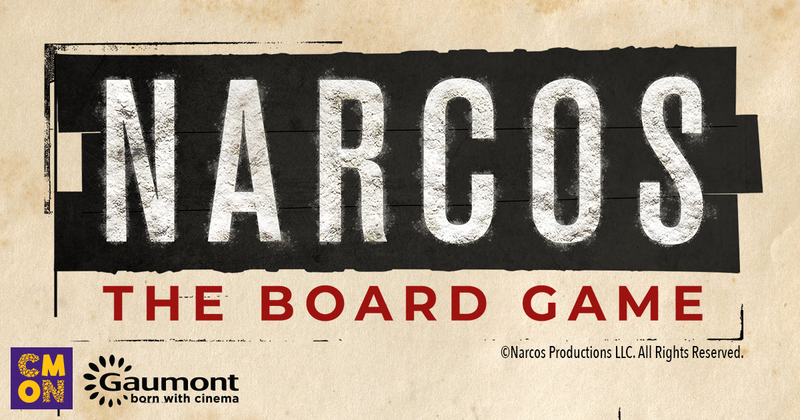 Narcos: The Board Game is scheduled for release in Q4 of 2018 with an SRP of $54.99. Those attending CMON Expo 2018 will be able to see the game firsthand from May 11 to May 13 in Atlanta, GA. Formed in 1895, Gaumont is the first and oldest film company in the world, with offices in Paris and Los Angeles. In the past few years, the company’s release schedule has continued to increase across film and television production, in both the French and English languages. The film library now encompasses over 1100 titles including films from such prestigious directors as Luc Besson, Matthieu Kassovitz, Francis Veber, Jean-Jacques Beineix, Federico Fellini, Maurice Pialat and Jean-Luc Godard, and more recently Toledano and Nakache for The Intouchables, the highest-grossing French language movie ever with over $450 million in revenue to date. Gaumont produces and distributes high-quality TV programming worldwide. Key drama series include the award-winning Narcos for Netflix; the critically acclaimed Hannibal; the winner of “Best Series” (Festival of Fiction TV) The Frozen Dead and The Art of Crime, amongst many others. The animated catalog comprises over 800 half-hours, broadcast in over 130 countries. Current productions include Noddy (season two) co-produced with Dreamworks, Trulli Tales, Belle & Sebastian, Furiki Wheels, and F is For Family (season three) for Netflix. In development is the series Do, Re & Mi with the multi-talented Kristen Bell. This raw, gritty series chronicles the gripping real-life stories of the drug kingpins of the late 1980s and the corroborative efforts of law enforcement to meet them head on in brutal, bloody conflict. It details the many, often-conflicting forces - legal, political, police, military and civilian - that clash in the effort to control cocaine, one of the world's most valuable commodities.